You can park on Edwin our North/South street, or on North side of Dupont East of the restaurant. Nearest subway is Bloor & Keel. 4 min walk. Call & ask about FARMHOUSE @ yourHOUSE. Our private 'HUNT CAMP' room seats 9-12ppl at one high top table. The entire venue can accommodate 120 guests for buy out events. Serving #FARMHOUSEhospitality. Rooted in the charming influences of the rural Ontario farmhouse. A little bit country/ A lot rock & roll. Cooking a blackboard menu of #FARMdrivenFOOD. Pouring Ontario craft beers, ciders + artisanal VQA. Super interesting menu. Everything was delicious. Service was great. Our 30 somethings find it hard to get us all together due to busy schedules, so the fact that we could reserve a table for a Sunday brunch here was a huge help to our scheduling issues. The coffee was flowing and the food was deliciously different! A good time was had by all. The noise level was deafening when we entered so we were very relieved to be seated in the adjoining room by the window. And this worked for us – closer to the open kitchen in this small second room would have been too noisy and chaotic. We knew the brunch menu was very limited but had anticipated a few more offerings including a frittata. The duck eggs "benny" were a bit of a shock. Regretfully, we failed to ask about chicken egg options. 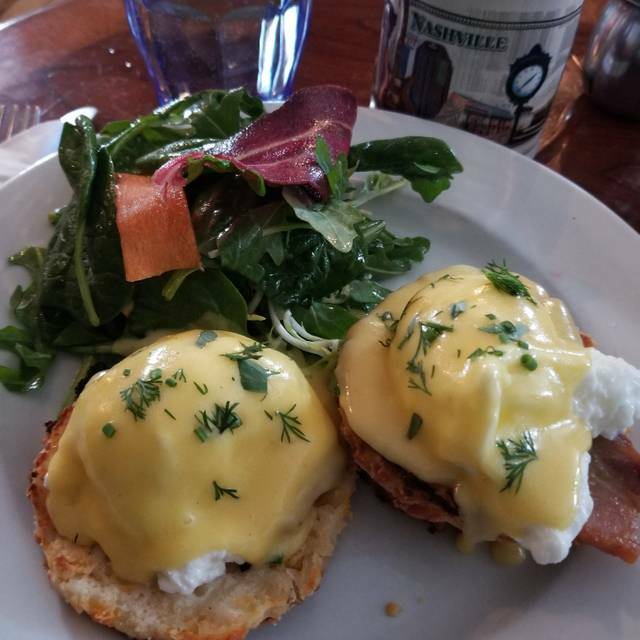 The eggs benny came with a choice of kale or a combo of salmon and bacon. Both versions featured a griddled biscuit – not the world's best idea – dense and greasy. The hollandaise, presumably also duck egg had a forgettable personality of its own. The accompanying salad was unremarkable. The restaurant was so jammed-packed we had to leave the table to find a server for water refills and the cheque. Overall good experience with the food and service. The only drawback was when the guy brought my friend back her $15 change, he took $5 back. Probably as a gratuity, but he took it WITHOUT EVEN ASKING (this guy wasn’t our server). My friend said she was planning to leave the $10 as a tip to our gracious and warm waitress, but since he did that she changed her mind. It was great- just felt a bit rushed since we booked brunch a month ago and were in and out in an hour and 15. Maybe not the best time to try and catch up with friends but nonetheless delicious food and ambience as always. Will continue to recommend and go back! The chef was so friendly, she came out and recommended dishes, asked how our meal was and was entertaining other tables in the same way. It was a great atmosphere! Also the servers were very friendly and helpful as well. Excellent local spot, great for foodies with a fresh menu each visit. Staff is friendly and welcoming. Bar sitting overlooking the kitchen was a great experience. Food is always awesome, as is the entire staff. Excellent food at good value. Great little neighbourhood spot. 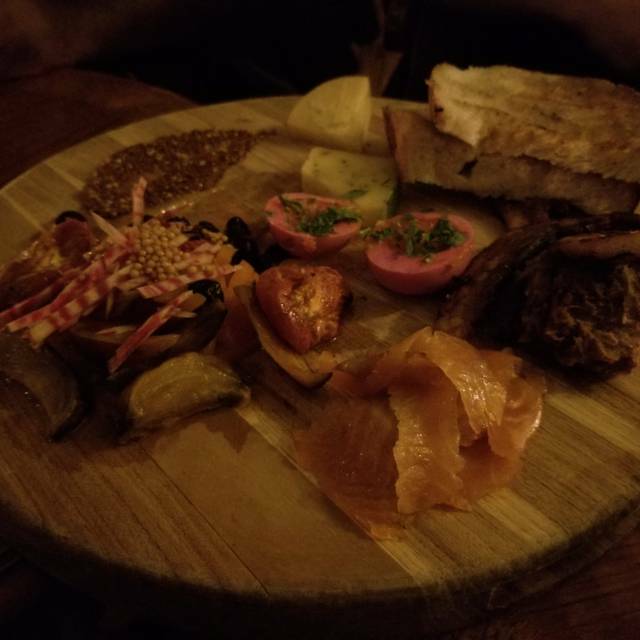 I was recommended Farmhouse by a friend because I'm from out of town. I went for brunch and was seated at the bar, which was great! Being right at the bar our server was right in front of us and quickly got us our drinks. I had to get up to see the menu but my server walked me through the cutely named dishes. My wife is a vegetarian but really wanted to try the eggs benedict so the chef made her a special tomato and basil vegetarian option. Food was great, really enjoyed my quirky server. It was a little cold in the restaurant and the coffee wasn't great but over all an amazing brunch. Highly recommend and recommend sitting at the bar! Very cold inside made worse every time the door opened. A warm and cozy enough ambiance for a miserable March day. A little loud, though admittedly, we were there at the peak of Sunday brunch rush hour. 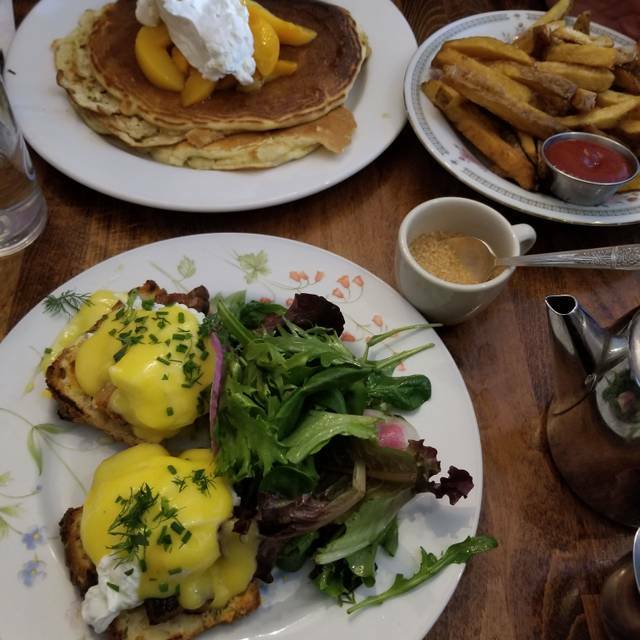 Both menu and food lives up to its appetizing reputation, give or take details such as average coffee and slightly overdone cheese biscuits (which serve as the inspired base for delicious “trout benny” but did not even yield easily to a steak knife!). Would definitely go back to sample some of the other very tempting items on the menu. This place is great in theory, but the servers need to be more attentive. 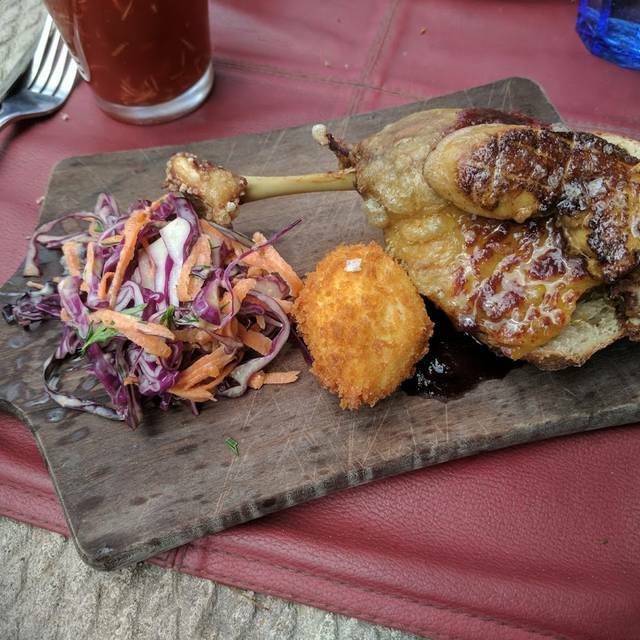 Food was great, once I got what I actually ordered. Food and service is consistently great. I was slightly disappointed in the back room we were given for a party of 9 that included a toddler. The table was about a foot and a half taller than the high chair provided so she couldnt see any of us and didn’t have a surface to eat on even though I noted these details in the reservation. The other chairs around this table were very uncomfortable - seats from actual tractors. Perhaps something to keep in mind if you’re booking for a larger group. Very enjoyable atmosphere and friendly staff. Burger was great. We made our reservation 3 weeks in advance for 5 people. When we arrived, we were seated at a tiny table for 4 with an extra chair at the end. There was hardly room for our water glasses and coffees, plates sat on top of each other. We asked the staff to add another table or make some accommodation, but they just said no, without an apology or explanation. The food was good, but one order was wrong so had to be returned to the kitchen, so we could not enjoy our meals together. Last but not least, the odour in the washrooms was extremely off-putting! None of us will return. Great food choices with vegan options. No waste on menus everything on the chalkboard. Very sustainable! Love the feel here. Wonderful staff as well. Visiting the neighbourhood, we made a same-day brunch reservation with @OpenTable successfully at the time we wanted. The atmosphere is EXACTLY like the Farmhouses I grew up in. The staff were professional, cheery, responsive and knew the menu inside and out. The restaurant was BUSY, the concierge handled patron flow like a master and our server capably responded to several tables with ease. The FOOD was insane. Now, I was VERY hungry. I wanted to order one of everything. I had the burger (their specialty) on a lettuce bun with side salad. Hubs had the pancakes with side bacon. We ordered the made daily bread pudding with an extra side of bacon for dessert. All in, I’d eat here daily if my waistline would allow. I loved that we could see right into the kitchen, nestled in the heart of the restaurant - the chefs and servers bantered and prepared each dish with a massive amount of attention before sending them out. Only draw back would be accessibility. The washrooms are down a steep staircase, however accurate of most farms I knew! Will be back. This was our first visit. We all loved the ambiance - the fantastic wooden floors, the old photos, the license plates on the floor near the bar. Our server was lovely and friendly. We were there for brunch. The only downside was the menu is fairly limited. That said, we all enjoyed what we ordered. The best burger in the city, bar none and extremely good staff! The food here was surprisingly AMAZING!! I loved the VEGAN HARVEST dish, so tasty and filling and my husband LOVED the BURGER. He couldn't stop raving about the addition of the pork belly bacon to the burger and also loved the fries and draft beer. He claims this burger to possibly be one of the BEST! We initially came in for shuck-a-buck oysters. The oysters were 'ok.' But the rest of the food and service was on point! Service staff was prompt and knowledgeable. Great vibe and awesome food. Definitely going back! The four of us all enjoyed our meals. The waitress was very responsive and pleasant. Interpreting restaurant. Great service and a really comfortable environment. Friendly staff and they take reservations for brunch. What more could you ask for ? Amazing food and service. The vibe is very chill and relaxing. Food is always excellent. Love the vegan options. Great local beer and wine. Helpful and friendly servers. Lovely place for foodies. I am always very happy for their roasted vegetables, and my meat-eating friends have a blast. They need someone to help them with desserts, though. Love being able to make a reservation. Food was very good. Nice setting. Really good service. Definitely will go back. For 4 people with wine pairing and shared app our meal was $250 + tip which didn’t feel in line with our experience. Always love a farmhouse visit, everything is so good! Amazing service and the food was so flavourful! I'll definitely be back! Great eats, great atmosphere. Cozy little brunch spot. We had a family brunch on a Saturday for 8 people and everyone loved the food, the service and did I say food? The quality of our meal was outstanding! Warmly welcoming and friendly service. Food was very flavourful and came quickly. Butter is the star in many dishes (no complaints about that - love butter!!) only criticism is that portions are smallish for the price - especially the vegetable sides to the main courses. No children’s menu, but high chairs available and very welcoming staff.